Bodo Seewald, born in 1968, holds a degree in economic trade and is specialized in Sales and Marketing. Starting his career as an account manager for Datagroup, Bodo Seewald moved on to become a Managing Director and principle shareholder with system vendor GeoCom in 1995. 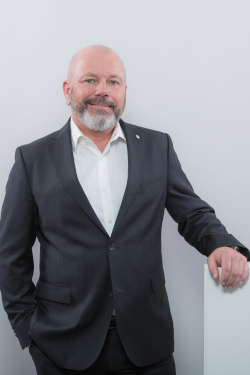 In 1999, he joined Electronic-Design GmbH as Chief Operational Officer (since 2001 officer with statutory authority) primarely responsible for sales and marketing, prior to moving on to esz AG calibration & metrology in 2003. Inititally, Bodo Seewald was assigned responsibilities as a sales, marketing and project management director with esz AG. Ever since Bodo Seewald prides himself in defining highly innovative and continuous sales & marketing strategies for extrordinary growth and sustainable success. New concepts for field and inside sales guarantee an outstanding, unrivaled level of customer service. In 2010, Bodo Seewald became part of esz AG calibration & metrology's managing board of directors, primarly responsible for Sales & Marketing.